RICHMOND, VA—Sighing loudly and expressing a deep regret regarding the naïve and starry-eyed assumptions he had made about a recent supermarket purchase, local 32-year-old Noah Willson lamented to reporters Thursday that he had been duped by the glamorized manner in which a can of beans had been portrayed in a television commercial. “What a fool I am to have fallen so hard for such a silly romantic notion,” said Willson, realizing that the pile of beans that lay on the plate before him bore little resemblance to the fantasy he had seen depicted in a softly lit 30-second ad with slow-motion shots of the product cascading into a pot against the backdrop of a rustic old-world kitchen. 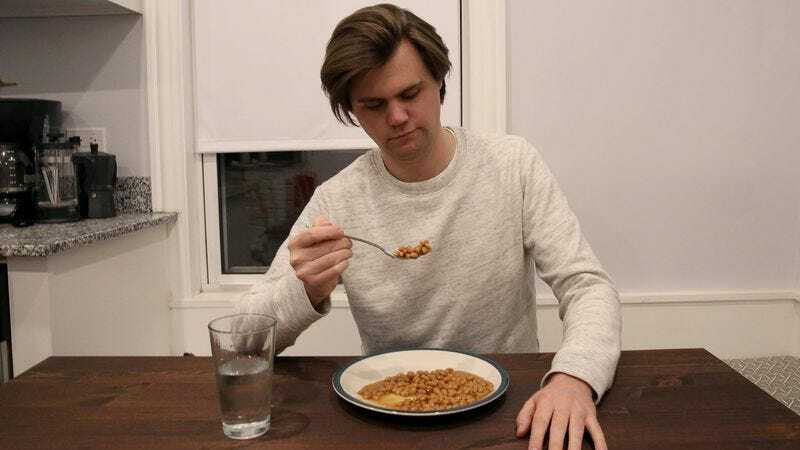 “How preposterously idealistic was it to imagine that I, too, might experience a small piece of the joy that family in the commercial seemed to feel as they smiled and laughed together, lingering over their dinner of baked beans? I am but a simpleminded buffoon.” His dreams of an elegant and joyous meal of beans dashed, Willson reportedly discarded the disappointing food item and turned with a hopeful smile toward an alluringly adorned box of microwaveable pizza.